Automobilista v1.4.5 is released – includes new free content as the Stock Car 2017 season & Curvelo race track are now included! * For this build Medium aggression is generally recommended for best AI racing; higher settings may be suitable for tin tops in which more bumping & rubbing is acceptable; Low aggression disables all new risk bypassing functions and effectively reverts to their pre v1.4.5 behavior with regards to overtaking. ** Users of digital inputs should review their settings for steering, throttle and brake rates. *** All cars / tracks still allows race refuelling for all classes, so users looking to get around series refuelling rules should use that for both single & multiplayer races (be advised that AI fuel strategy for longer races may not be ideal). Important note for Logitech G29 / G920 users: Support for auto rotation is still on a dedicated Beta Branch labeled v1.4.5_G29. Further instructions as to how to switch to a beta branch here. If you have an online race tonight, you may stick to or revert to the previous v1.4.32 by selecting that branch from the Steam Beta tab. Further instructions as to how to do that here. Further info regarding above changes: for ex. F-Ultimate @ Montreal, AI will now qualify and start race in UltraSoft compound; since series has AIRaceCompoundSwitch=1, AI will then switch to SuperSoft if / when it stops for tires as per 2017 compound options & strategy; If it´s a F-Extreme race @ Montreal, AI will start on SuperSoft and switch to Softs as per 2015 compound options & strategy. If it´s tracks with no compound restrictions, AI will always run the softest compound and switch to the next up in tire stop. F-Classic will qualify on qualifying tires but will always race on C race compound; if it does a tire stop it will just switch to a new C set. Series that don´t have multiple tire compounds and / or don´t feature in the track GDB will continue using the default compound as before. Mod tracks should be updated to use this latest syntax in order to feature compound restrictions. For the next release we expect to have it fully integrated into the main branch. If you have an online race tonight, you may stick to or revert to the previous v1.4.05 by selecting that branch from the Steam Beta tab. For further difficulties related to installing, running or setting up the game, please refer to USER MANUAL present as a launch option from Steam If you need further assistance please post it in the troubleshooting topic or email support@reizastudios.com (please allow for up to 1 business day for a reply). Last but not least: AMS Base, Season Pass & individual DLCs are all on the Steam Summer sale with great discounts – if you´re missing anything make sure to check them out! Automobilista v1.40 is released, along with a new DLC: Hockenheimring is now available for purchase! For further difficulties related to installing, running or setting up the game, please refer to USER MANUAL present as a launch option from Steam. Hello everyone – happy to be back with our first Development Update of 2017! We hope you all had a good time over the holidays – on our side I´m happy to say the whole team enjoyed some much needed rest over the holiday season, but we have been hard at work and firing on all cylinder again since early january. As usual it´s my pleasure to share with you some of the results, info and previews of the work we´ve been doing since then. We´re approaching the final stretch of Automobilista development, with only a few more months now planned until AMS reaches its definitive state, at which point we´ll switch focus 100% to the future. We´ll be pushing to provide a full overview of these developments along with confirmation of remaining DLCs by our next development update. For now, here´s the stuff in the immediate horizon. On the audio front, having decided he wasn´t happy being just an ace audio engineer, @Domagoj Lovric began exploring the codebase for possible short-term improvements to add some extra depth to the audio experience in AMS. One of these improvements will be the implementation of reverb audio, the initial version of which will already be present in v1.3.0, with much more to come. @Alex Sawczuk has also somehow managed to find a window in his fairly hectic track production schedule to squeeze some fresh shader improvements and adding support for visible & dynamic track dust. Although the effects of which already present in AMS along with offline marbles, there wasn´t yet a visible dust layer over the track surface. This has now been implemented. The difference looks subtle on screenshots but it adds some noticeable extra depth and life to the track surface while driving in-game. Some of the tracks have already been updated to use these developments so Season Pass owners will be able to check them out in the upcoming beta release expected for tomorrow morning, with most of the other tracks expected to be updated as we progress. Several car physics have also received some updates for v1.30 as both @Niels Heusinkveld and myself continue to chase for improvements. One car in particular has received special attention as Niels has given the Boxer Cup physics a complete overhaul, with revised aerodynamics, chassis, and the addition of helper springs to the suspension, which substantially improves handling over curbs. The initial version of these revised physics is also coming up with the next Beta update. One major new feature previously confirmed in our end of the year Dev Update was the Custom Season Tool – unfortunately it´s looking unlikely we´ll manage to complete the full feature in time for v1.3.0, but a number of associated new options & features should hopefully already be in, such as the option to enable a mid-race full course yellow as per the rules in the Formula Truck series, and ability to customize the number of opponent cars from each class in a multiclass event. You may check a complete list of all the additions, improvements & fixes since the last v1.2.1 release up to the latest Beta in the changelog attatched. We also have a new car coming up in the next release with the frisky Aussie Racing Car Camaro – further good news is that unlike originally predicted, this will be released as a free car to the base game and not as a DLC. V1.30 will also see the release of part 2 of our “Legendary Tracks” DLC series – the famous Adelaide street circuit is coming up in two versions: the longer historical layout of 1988 which hosted the Australian GP from 1985 to 1995, the new modern version along with its Supertruck variant. @Dave Stephenson has also been hard at work developing our Virtual Xperience portal, and we´ve got a substantial update coming up along with the release of AMS v1.3.0. Users will be able to login into VX using their Steam Account – this opens up opportunities to give a more personalised experience in the various areas of VX. In the first instance the settings page accessible from the top naviagation bar provides the much requested ability to override your display name and country flag, overriding the settings collected from Steam. The new Community section will also be available in the next update, providing a one-stop-shop to find communities and leagues serving users of Automobilista and other Reiza titles based on regions served, languages used or days they host races. The league finder in this section will also provide a similar service for leagues so users may find leagues that based on race days, event frequency, or your favourite series. Community leaders and league admin are invited to submit their information to the directory following the instructions in this topic – every league admin who submits a valid entry will be gifted 2 promo Steam keys for AMS to be given away for his participants. With these and some other substantial improvements coming up, VX will soon be playing a bigger role in fulfilling the experience with AMS, including hosting some prize awarding competitions. Watch this space! It has been a long, hard but very fulfilling year for everyone at Reiza – we´ve brought out Automobilista in march and have been working very hard since to keep it growing and evolving throughout. We´re happy to say we´ve reached our main goals, though work is still to continue hard into the initial months of 2017 to fulfill its potential as we envisage it, before we finally wrap it up to shift focus to the longer term. The next milestone for AMS is still to come before the year ends, as v1.20 and Formula Truck are still to be released at some point next week! Here´s the summary then of the stuff we´ve been working on. We have nice developments coming for v1.20 – you can read through it on the changelog attached for the latest Beta updates since v1.1.6 release. For the cars, one highlight is the filling up of the Caterham series from the Brit Pack to include some new variants from their motorsport ladder. On the audio front, @Domagoj Lovric has done an extensive revision of several sound effects both on the code as well as the samples themselves – tire rolling / scrub / skid, wind noise, chassis scraping, to improve the organic interaction of these sound effects with the physics engine and hopefully provide both better feedback from the cars as well as increased immersion from the driving experience. There is some early WIP stuff already on Beta but the full results will be in the new beta build coming out later tonight. We´ve also done some progress with AI, with further fine tuning in various fronts. @Luis Miguel has nailed an old bug where AI would not properly estimate fuel for timed races, taking much more fuel than they needed for the distance. If you´re used to running quick timed races then you may have to do some tweaking to your usual AI Strength, overall though performance should be a lot more consistent in that type of race. As you know v1.20 will also bring a new DLC in the shape of Formula Truck , who we are happy to confirm will be officially added to Automobilista, fully revamped from the original game, prettier and meaner! To begin with, as renewing the Formula Truck license has been a fairly late development we will deploy the same 2013 season we had in the official Formula Truck game; chances are good though we´ll expand on that with the new season as we move through 2017. One of the custom Formula Truck features we´ve added for this release is the Speed Trap rule – every Formula Truck layout has a Speed Trap in a section of the track (usually the fastest, indicated by icon on its trackmap, a flashing icon on top left corner as you approach it while driving, and by a line of cones trackside) through which drivers are supposed to cross going no faster than 160 km/h. Exceeding 160 km/h through the Speed Trap will result in lap being invalidated in practice / qual, or an instant drive-through penalty in races. Players however retain the option to switch the rule off from the Rules menu. We are currently still working on getting diesel smoking blowing from the exhausts to create some proper nasty virtual pollution – it probably won´t be quite ready for initial release but it should follow in the next update. Formula Truck for Automobilista will sell for US$ 5.99, but will be free to everyone who already owned Formula Truck 2013 on Steam. Recently we´ve conducted a poll among Reiza 51 members to gather which features they would most like to see us develop for Automobilista. While not all options were realistic in the short term, the idea was to gauge what users wanted most so we could factor not only into our remaining dev plan for Automobilista, but also longer term as we shift focus to the next title. A few of these options are already in the works for Automobilista as previously alluded – one we can confirm to be in the pipeline is the Custom Season Tool for Championship Mode, which will allow users to design their own seasons, mix up classes, define points system along with a few more interesting new options which will also be available in other game modes. We´re also intent on doing more work to AI behavior, rectify a few old issues and add a few new variants to get them to behave more realistically and provide a stiffer but fair challenge. We have a new build coming up for our Virtual Xperience portal as well – @Dave Stephenson has been pushing hard to complete the new Community section to go along with our League Finder tool, providing a searchable directory of communities and leagues serving AMS users. Work is still going at full speed to develop the upcoming DLCs. There have been a few tweaks to the release plans, one of which being the switch in order for the upcoming Legendary Track packs coming up. The famous Adelaide hosted many classic season finales as the Australian GP from 1985 to 1995, and is still run today for many popular aussie racing series, having retained a lot of the charm and unique challenges from the GP days. In this (very early) preview of the mesh above, you get a sense of the workload involved in creating a street track such as this to modern standards – in order to deliver the full urban feel of the venue, @Alex Sawczuk, @ilya and the rest of the track team have to model a whole segment of the city neighborhood and roads adjacent to the ones used by the actual race track. Then we´ve got to fill these surroundings up with all the buildings and other trackside objects, which demands a solid 4 months worth of man-hours from the environment artists! We´re confident this legendary track will be worth the effort and that will make a great place to race several existing as well some of the upcoming cars. Adelaide will come in 2 versions – the longer historic 1988 layout as well as the modern 2016 track. Both versions are expected to hit beta some time in February with release following soon after. Legendary Tracks Pt 3 – Hockenheim confirmed! We´re happy to finally confirm the historic german Hockenheim Ring will also be coming to Automobilista! The shorter modern version has retained the stadium section and remains a great venue for close wheel-to-wheel racing for many of the major international series. As with Adelaide and Imola before, the option for Hockenheim as a subject for the Legendary Track series derives from it combining many values – great relevance both in terms of historical heritage as well as presence in the modern autoracing scene, a natural venue for several of the series present in Automobilista, and an unique experience to complement the others already offered in the sim. Hockenheim will receive same treatment as Imola, with the pack featuring the long version in its various guises from 1972, 1988 and 2001, along with the modern 2016 version. Work on the track is also already underway, and it´s estimated initial versions will hit Beta in March, with full release towards the end of April. With all these tracks news one would be forgiven for getting the impression the car front is being neglected, but that would be wrong :p bigger news will have to wait a bit more however, hopefully as a topic for our first dev update of 2017. We have also found a bit of time to put together a neat christmas present to go along with v1.20 release. Obviously we won´t say or show what it is as that would spoil the surprise, but here´s a little teaser to get you guys guessing. It´s been a busy 18 months! To begin with a little retrospective of the past 18 months from the car & track guys – this will probably sound like we´re tooting our own horn a bit but mainly it´s a small tribute to a team who have been working exceptionally hard and really shifted up a gear in this last year and a half. A total of 13 new venues along with 20 car models for 14 series have been released over a period of 18 months. That in itself is notable, even more so if you consider that in the same timespan all old content was updated to keep up with newer standards and include all latest features – a total of 27 series and 38 tracks which currently features in AMS. It´s easy to underestimate the workload involved in delivering all this – if you´re on the other end waiting for stuff to materialise, it probably doesn´t feel very fast at all make no mistake though, this would be substantial output even for a bigger team with bigger budget than ourselves, so there´s a feeling of mission accomplished in delivering on what has been a very aggressive plan. Beyond the sheer volume, there´s also satisfaction from the fact that quality standards have not only been retained but upgraded, and older content has not been left to become too outdated relative to the newer stuff, so the sim remains as consistent as possible no matter what and where you´re racing. We´re not going on vacation just yet though – in fact we´re still still pushing hard not only with new content but also towards several significant new features and general improvements all across the sim – there are some exciting things already in the works with others being evaluated, but with development being what it is and known to throw some curve balls on occasion we´ll refrain from jumping the gun and push to cover a bit more ground before we confirm stuff. If you´re a Reiza Member though you may not only have a glance of what we´re aiming for, but help influence the development path in this Reiza 51 poll. We´ve got one, possibly two updates to be delivered over the course of this month, with v1.15 scheduled for November 15th. One important note regarding this update: @gongo has been working on integration with the latest Logitech drivers to better support G29 and G920. This however will require all users on Logitech wheels to upgrade to their latest software – even those running older models like G25 or G27, so those running Logitech gear please be advised to upgrade in time for v1.15 release. The 1972 & 1988 versions are hitting AMS Beta within a couple of hours from this post. 2001 & 2016 should follow next friday. Legendary Tracks Part 1 – Imola will sell for US$ 5.99 on release, scheduled to come along with v1.15 on November 15th. For those of you keeping track of AMS development, it will come as no surprise that the trucks from Formula Truck are bound to come to Automobilista – fully revamped and featuring new custom rules and functionalities. The good news is that we´re very close to finalizing a new deal with Formula Truck series, which would allow us to officially release the complete, fully branded series (not just the trucks) for AMS. That would in turn open up the possibility of expanding this pack to include the latest season in a future update. One way or another, to begin with we´ll be releasing the Trucks from 2013 after Imola – the pack will also sell for US$ 5.99. As previously announced, this DLC will be free to those that already own Formula Truck on Steam (if you own the non-Steam copy make sure to retrieve your Steam key for it here). Always worth reminding also that those who took part in last year´s crowdfunding campaign on any level, acquired our Membership pack or bought the Season Pass on Steam have already secured these and all the other DLC packs to come to AMS. We´re happy to announce Automobilista is being officially released as v1.0 this wednesday August 24th! The official release will bring a new series (F-Vintage 1967 & 1969), new track layouts, along with an extensive list of fixes and updates to the current Early Access version. Prices will also remain discounted until Sunday 29th for the full Reiza Membership Package (base game + all DLCs + beta access) @ US$ 54.99, and Membership upgrade (all DLCs + beta access for those that already own the game) for US$ 24.99. The full changelog for v1.0 updates will be released at launch, tomorrow August 24th! A new Early Access build of Automobilista has been released – v0.9.8 is now out. If you have a multiplayer race tonight, you may want to check with the league admin whether you´ll be racing with the old version or this latest v0.9.8. Previous v0.9.67 is still available as a Beta branch on Steam (by right-clicking Automobilista on Steam -> Properties -> “BETA” tab, and selecting v0.9.67 from the dropdown box). As per the changelog, V0.9.8 features some substantial Force Feedback updates – read about these in the AMS FFB topic. If you wish to discuss the new track limit violation system, please use this thread. If you have a bug to report please use the bug report thread. (make sure to check the opening post). A new Early Access build of Automobilista has been released – v0.9.3 is now up with some fresh new content as well as several updates & fixes. This is mostly a hotfix to address a few issues from the previous version. Automobilista: EA Dev Roadmap & Beyond! With Automobilista now a couple weeks into Early Access, we would like to present an overview of our upcoming plans towards the full release of the sim, and a glimpse beyond..
We estimate AMS to continue in Early Access until the end of April. New builds should roll out every week for the beta, and every fortnight for the release version of AMS, generally in between Thursday and Friday. A new build is schedule to be deployed for the public release version of AMS tomorrow (18/03). One of our priority goals for Early Access is to develop resources to facilitate, complement & stimulate the community´s continuing engagement with Automobilista. Web-based Multiplayer Lobby: In addition to the current Matchmaker from the Steam client, users will be able to view & join multiplayer sessions from this Reiza web portal (without necessarily launching the game first). This lobby will eventually be accessible from in-game too. Official seasonal competitions tied to the real racing series we represent, presenting some special prizes and opportunities to bridge the gap from virtual to real racing. Parallel to this, we continue to work in the product itself – AMS core focus is to deliver a cohesive racing simulation platform with a large variety of cars and tracks and advanced simulation features. As usual we will also continue trying to improve the existing platform by ironing out as many issues adding as many improvements as we possibly can so people can enjoy AMS as seamlessly as possible, including the expansion of our user manual (the partial version already available as launch option from Steam). The Boxer Cup was voted as the bonus car by backers of the Sim Racing Bonanza campaign. This rear engined, flat-6 Boxer Cup is a 2015-spec car and is meant to fill the gap for a GT3-type car in AMS in style! One of the final missing bits of content proposed in the Sim Racing Bonanza campaign, theCopa Montana used to be the support series to Brazilian Stock Car, running from 2010 to 2013. The car is based in the old (pre-2009) Stock Car V8 chassis, and has a slightly less powerful V8 engine (350 HP vs 450 HP). The manual sequential gearbox (vs semi-automatic in the main series) brings an extra degree of challenge to the vehicle, and the Montana pickup-style bodywork adds an unique cool variant to our car roster. Virginia International Raceway was voted as the bonus track by participants of the Sim Racing Bonanza campaign, and it will come as an official track to add a very special all-American flavour to the AMS track line-up. This long, winding thrill ride set amongst forests and luxurious resorts includes several layouts, all of which featuring challenging flatout S corners and lots of opportunities for close racing with pretty much any type of car. 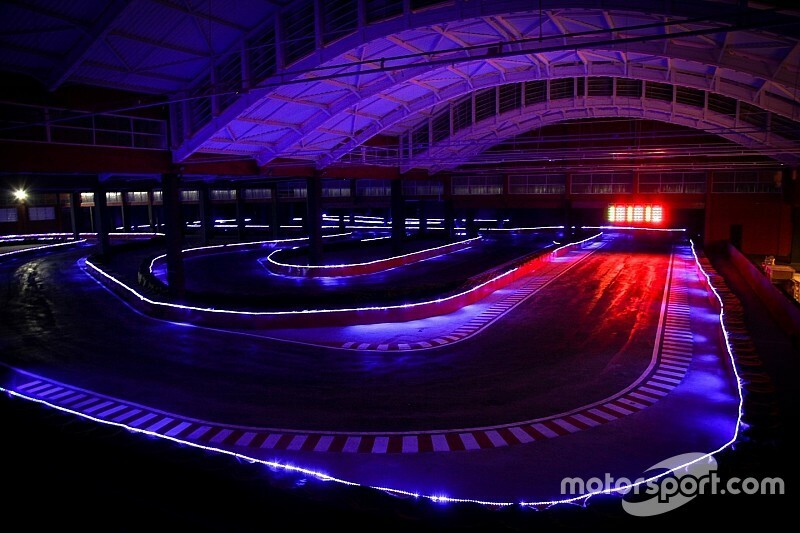 Speedland is a new karting facility set in the heart of Sao Paulo, mixing indoor with outdoor environments. This track is one of the fresh additions not previously announced to the AMS line-up. A semi-fictional racing playground based on a German airfield in the town of Mendig – the venue will include a full traditional “airfield” style racetrack between runways and apron roads, eventually growing to also feature variants expanding through the small village & forests that surround the airfield. The airfield itself will be filled a wide variety of challenges and test beds all types of sandbox physics stunts such as a huge Hotwheels-style ramp, a cross-over Supertruck track, slaloms, skid pads and other variants for general oddball fun & games with cars. Mendig Airfield Gymkhana is another free, previously unannounced addition to AMS. Formula Vintage – new GP series based in a late 60s F1 car to complete our GP heritage line up, covering 6 decades of the sport. Ibarra – Pitoresque old-style Ecuadorian track set in between a beautiful mountainous scenery and the lake Yawarkucha. In addition to all the free resources, developments and content presented above, Automobilista will also receive some extra cars & tracks in the shape of paid DLC packages, all sold individually for very reasonable fees, or as a package in our Reiza Membership deals which will also offer some further value for money. More information on these packages will be divulged very soon. A new EARLY ACCESS build of AMS (v.0.8.6r) has been deployed now on Steam. Please keep the discussions & questions pertinent to the new build and the list above here. If you have a bug to report please use the bug report thread. (make sure o check the opening post). Fixed omni on chicane road meshes and added collision mesh to fence inside final turns for Taruma. AUTOMOBILISTA: is now available on Steam Early Access! Beyond the brazilian core, AUTOMOBILISTA is extensively complemented with one of the most diverse selections or racing vehicles you will find in a racing game: only in AUTOMOBILISTA will you be able to jump from a rental kart to a 800-HP F1 car; from drifting a Rallycross EvoX to jumping ramps in a Supertruck; from mastering the driving basics in a Formula Vee to managing a full 24h race in an endurance prototype; back and forth through historical and modern content featuring a sample of several decades of GP racing – all of this and much more within a few mouse clicks. Thoroughly researched and cohesively developed for maximum simulation accuracy, AUTOMOBILISTA captures the fun only motorsports in its various forms can provide.